Miguel Cabrera - 1B DET Fanduel: 4300 Draftkings: 5400 - Cabrera goes against Brett Oberholtzer at Comerica Park (Detroit, Michigan). Oberholtzer has an ERA against righties of 5.05 with a wOBA of 0.391. In addition, he is really struggling on the road. His ERA on the road is 6.16 and his wOBA is 0.393. During the last week of games, Cabrera has scored 12.3 Fanduel fantasy points while his season average is 11.6. He has a batting average of 0.348 and a slugging percentage of 0.609 over that time. Cabrera at home0.279 and has a wOBA of 0.416. Cabrera hits lefties extremely hard. His ISO is 0.174 and has a wOBA of 0.363. Following a 3 hit performance yesterday, Ryan Zimmerman - 1B WAS Fanduel: 3000 Draftkings: 4000 - Zimmerman faces Jorge De La Rosa at Nationals Park (Washington, D.C.) which ranks number 6 in runs scored. De La Rosa has an ERA against righties of 4.98 with a wOBA of 0.350. In addition, he is really struggling on the road. His ERA on the road is 5.4 and his wOBA is 0.360. Zimmerman has faced Jorge De La Rosa 17 times with a slugging percentage of 0.647 with 1 homeruns. Joey Votto - 1B CIN Fanduel: 3900 Draftkings: 5100 - Votto squares off verse Zack Godley at Chase Field (Phoenix, Arizona) which ranks number 2 in runs scored and number 7 in home runs allowed. This game has a high over under of 9.5, so expect some runs to be scored. Godley has an ERA against lefties of 5.96 with a wOBA of 0.357. Also he has not done well at home. His ERA at home is 5.86 and his wOBA is 0.370. Votto on the road is incredible. His ISO is 0.191 and has a wOBA of 0.404. Votto hits righties big time, to the tune of an ISO of 0.241 and has a wOBA of 0.42. Mike Napoli - 1B CLE Fanduel: 3300 Draftkings: 3800 - Napoli goes against A.J. Griffin at Globe Life Park in Arlington (Arlington, Texas) which ranks number 7 in runs scored. The over under on this game is huge, at 9.5, so get ready for a lot of runs. Griffin has an ERA against righties of 3.88 with a wOBA of 0.294. His ERA at home is 4.79 and his wOBA is 0.328. Napoli hits righties extremely hard. His ISO is 0.245 and has a wOBA of 0.348. Carlos Santana - 1B CLE Fanduel: 3800 Draftkings: 4700 - Santana is taking on A.J. Griffin at Globe Life Park in Arlington (Arlington, Texas) which ranks number 7 in runs scored. 9.5, so get ready for a lot of runs. Griffin has an ERA against switch hitters of 5.52 with a wOBA of 0.392. His ERA at home is 4.79 and his wOBA is 0.328. Santana on the road is awesome and his ISO is 0.230 and has a wOBA of 0.351. Santana hits righties very hard. His ISO is 0.274 and has a wOBA of 0.368. 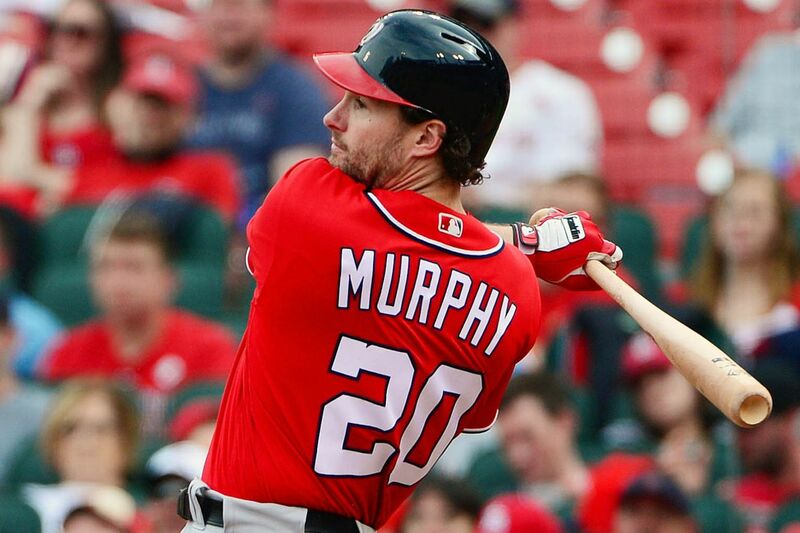 After a 3 hit outting yesterday, Daniel Murphy - 2B WAS Fanduel: 4300 Draftkings: 5000 - Murphy will face Jorge De La Rosa at Nationals Park (Washington, D.C.) which ranks number 6 in runs scored. De La Rosa has an ERA against lefties of 5.34 with a wOBA of 0.343. He's playing poorly big time on the road. His ERA on the road is 5.4 and his wOBA is 0.360. Throughout his career, Murphy has faced Jorge De La Rosa 7 times with a slugging percentage of 0.286. Murphy has scored 19 Fanduel fantasy points while his season average is 13. He has a batting average of 0.370 and a slugging percentage of 0.778 over that time. He also has hit 3 homeruns. Murphy at home is great! His ISO is 0.234 and has a wOBA of 0.4. Murphy hits lefties very hard. His ISO is 0.237 and has a wOBA of 0.386. He should score some big points for you today if he is starting. Ian Kinsler - 2B DET Fanduel: 4000 Draftkings: 4300 - Kinsler will face Brett Oberholtzer at Comerica Park (Detroit, Michigan). Oberholtzer has an ERA against righties of 5.05 with a wOBA of 0.391. He's playing poorly big time on the road. His ERA on the road is 6.16 and his wOBA is 0.393. Kinsler at home0.159 and has a wOBA of 0.342. Kinsler hits lefties extremely hard. His ISO is 0.215 and has a wOBA of 0.372. Jason Kipnis - 2B CLE Fanduel: 3800 Draftkings: 4300 - Kipnis will face A.J. Griffin at Globe Life Park in Arlington (Arlington, Texas) which ranks number 7 in runs scored. The over under on this game is huge, at 9.5,Griffin has an ERA against lefties of 5.52 with a wOBA of 0.392. His ERA at home is 4.79 and his wOBA is 0.328. Kipnis on the road is great! His ISO is 0.178 and has a wOBA of 0.335. Kipnis hits righties extremely hard. His ISO is 0.210 and has a wOBA of 0.355. Joe Panik - 2B SFG Fanduel: 3100 Draftkings: 4400 - Panik is facing Mike Foltynewicz at AT&T Park (San Francisco, California). Foltynewicz has an ERA against lefties of 5.08 with a wOBA of 0.353. In addition he really has been pretty weak on the road. His ERA on the road is 5.14 and his wOBA is 0.370. Through the last seven days, Panik has scored 15.1 Fanduel fantasy points while his season average is 9.8. He has a batting average of 0.333 and a slugging percentage of 0.733 over that time. Panik at home is money. His ISO is 0.117 and has a wOBA of 0.32. Panik hits righties in a big way, with an ISO of 0.163 and has a wOBA of 0.318. He can be in for a very nice game today. After a 4 hit performance yesterday, Anthony Rendon - 3B WAS Fanduel: 3400 Draftkings: 4600 - Rendonwill go against Jorge De La Rosa at Nationals Park (Washington, D.C.) which ranks number 6 in runs scored. De La Rosa has an ERA against righties of 4.98 with a wOBA of 0.350. Also he has been playing poorly on the road. His ERA on the road is 5.4 and his wOBA is 0.360. Through the times they faced eachother, Rendon has faced Jorge De La Rosa 12 times with a slugging percentage of 0.167. Over the last 7 days Rendon has scored 13.4 Fanduel fantasy points while his season average is 10.8. He has a batting average of 0.435 and a slugging percentage of 0.739 over that time. Rendon at home crushes it. He has an ISO of 0.180 and has a wOBA of 0.343. Rendon hits lefties very hard. His ISO is 0.165 and has a wOBA of 0.371. He should score some big points for you today if he is starting. Eduardo Nunez - 3B SFG Fanduel: 2900 Draftkings: 4200 - Nunez faces Mike Foltynewicz at AT&T Park (San Francisco, California). Foltynewicz has an ERA against righties of 4.18 with a wOBA of 0.317. on the road. His ERA on the road is 5.14 and his wOBA is 0.370. Nunez at home is incredible. His ISO is 0.148 and has a wOBA of 0.32. Nunez hits righties in a big way, with an ISO of 0.133 and has a wOBA of 0.32. Following a 3 hit outting yesterday, Eugenio Suarez - 3B CIN Fanduel: 3000 Draftkings: 3800 - Suarez is taking on Zack Godley at Chase Field (Phoenix, Arizona) which ranks number 2 in runs scored and number 7 in home runs allowed. This game has a high over under of 9.5, so I think you should expect a lot of fantasy points being scored. Godley has an ERA against righties of 5.17 with a wOBA of 0.318. Additionally, he isn't doing well at home. His ERA at home is 5.86 and his wOBA is 0.370. Kris Bryant - 3B CHC Fanduel: 4200 Draftkings: 5400 - Bryant will go against Julio Urias at Dodger Stadium (Los Angeles, California). Urias has an ERA against righties of 3.95 with a wOBA of 0.343. His ERA at home is 3.24 and his wOBA is 0.316. Through the last seven days, Bryant has scored 25.7 Fanduel fantasy points while his season average is 14.3. He has a batting average of 0.375 and a slugging percentage of 1.042 over that time. He also has hit 5 homeruns. Bryant on the road0.285 and has a wOBA of 0.427. Bryant hits lefties big time, to the tune of an ISO of 0.317 and has a wOBA of 0.431. You need to get him in your lineups today. Jake Lamb - 3B ARI Fanduel: 3500 Draftkings: 4500 - Lamb is going against Anthony DeSclafani at Chase Field (Phoenix, Arizona) which ranks number 2 in runs scored and number 7 in home runs allowed. There's a high over under on this game, 9.5,DeSclafani has an ERA against lefties of 4.60 with a wOBA of 0.371. His ERA on the road is 3.86 and his wOBA is 0.332. Lamb at home is great! His ISO is 0.357 and has a wOBA of 0.41. Lamb hits righties big time, to the tune of an ISO of 0.301 and has a wOBA of 0.391. Look for a big game. Danny Espinosa - SS WAS Fanduel: 3200 Draftkings: 4000 - Espinosa will face Jorge De La Rosa at Nationals Park (Washington, D.C.) which ranks number 6 in runs scored. De La Rosa has an ERA against switch hitters of 4.98 with a wOBA of 0.350. In addition he really has been pretty weak on the road. His ERA on the road is 5.4 and his wOBA is 0.360. During their career, Espinosa has faced Jorge De La Rosa 12 times with a slugging percentage of 0.417. During the past week Espinosa has scored 10.4 Fanduel fantasy points while his season average is 8.9. He has a batting average of 0.273 and a slugging percentage of 0.545 over that time. He also has hit 2 homeruns. Espinosa at home is incredible. His ISO is 0.201 and has a wOBA of 0.319. This guy should get some good fantasy points. Francisco Lindor - SS CLE Fanduel: 3600 Draftkings: 4400 - Lindorwill go against A.J. Griffin at Globe Life Park in Arlington (Arlington, Texas) which ranks number 7 in runs scored. There over under on this game is pretty big at 9.5,Griffin has an ERA against switch hitters of 5.52 with a wOBA of 0.392. His ERA at home is 4.79 and his wOBA is 0.328. Lindor hits righties very hard. His ISO is 0.146 and has a wOBA of 0.35. Jordy Mercer - SS PIT Fanduel: 2500 Draftkings: 3400 - Mercer is going against Jimmy Nelson at Miller Park (Milwaukee, Wisconsin). Nelson has an ERA against righties of 3.86 with a wOBA of 0.345. His ERA at home is 2.8 and his wOBA is 0.318. Throughout his career, Mercer has faced Jimmy Nelson 12 times with a slugging percentage of 0.167. Through the last seven days, Mercer has scored 13.1 Fanduel fantasy points while his season average is 8.1. He has a batting average of 0.263 and a slugging percentage of 0.684 over that time. He also has hit 2 homeruns. Troy Tulowitzki - SS TOR Fanduel: 2900 Draftkings: 3800 - Tulowitzki faces Ervin Santana at Rogers Centre (Toronto, Ontario) which ranks number 9 in runs scored and number 3 in home runs allowed. Santana has an ERA against righties of 4.00 with a wOBA of 0.307. His ERA on the road is 2.77 and his wOBA is 0.311. Tulowitzki at home is incredible. His ISO is 0.192 and has a wOBA of 0.318. Tulowitzki hits righties big time, to the tune of an ISO of 0.216 and has a wOBA of 0.33. He should be in for a great game as long as he is starting. Victor Martinez - C DET Fanduel: 3700 Draftkings: 4700 - Martinez goes against Brett Oberholtzer at Comerica Park (Detroit, Michigan). Oberholtzer has an ERA against switch hitters of 5.05 with a wOBA of 0.391. In addition he really has been pretty weak on the road. His ERA on the road is 6.16 and his wOBA is 0.393. Over the last 7 days Martinez has scored 16.2 Fanduel fantasy points while his season average is 10. He has a batting average of 0.381 and a slugging percentage of 0.667 over that time. Martinez hits lefties big time, to the tune of an ISO of 0.163 and has a wOBA of 0.343. This guy should crush it today if he is starting. Omar Narvaez - C CWS Fanduel: 2300 Draftkings: 2800 - Narvaez will be seeing Ariel Miranda at U.S. Cellular Field (Chicago, Illinois) which ranks number 8 in runs scored and number 13 in home runs allowed. Miranda has an ERA against lefties of 7.20 with a wOBA of 0.473. He's playing poorly big time on the road. His ERA on the road is 7.71 and his wOBA is 0.324. Narvaez at home is awesome and his ISO is 0.083 and has a wOBA of 0.375. Narvaez hits righties extremely hard. His ISO is 0.065 and has a wOBA of 0.384. Look for a big game. Mike Zunino - C SEA Fanduel: 2700 Draftkings: 2900 - Zunino is facing Jose Quintana at U.S. Cellular Field (Chicago, Illinois) which ranks number 8 in runs scored and number 13 in home runs allowed. Quintana has an ERA against righties of 2.98 with a wOBA of 0.297. His ERA at home is 2.87 and his wOBA is 0.270. Zunino on the road is incredible. His ISO is 0.175 and has a wOBA of 0.335. Zunino hits lefties extremely hard. His ISO is 0.389 and has a wOBA of 0.451. Buster Posey - C SFG Fanduel: 3500 Draftkings: 3500 - Posey will be pitted against Mike Foltynewicz at AT&T Park (San Francisco, California). Foltynewicz has an ERA against righties of 4.18 with a wOBA of 0.317. He's playing poorly big time on the road. His ERA on the road is 5.14 and his wOBA is 0.370. Posey at home is money. His ISO is 0.131 and has a wOBA of 0.345. Posey hits righties big time, to the tune of an ISO of 0.142 and has a wOBA of 0.336. Salvador Perez - C KAN Fanduel: 2900 Draftkings: 2700 - Perez is going against David Price at Fenway Park (Boston, Massachusetts) which ranks number 5 in runs scored. Price has an ERA against righties of 4.16 with a wOBA of 0.310. His ERA at home is 4.25 and his wOBA is 0.322. During his career, Perez has faced David Price 12 times with a slugging percentage of 0.833 with 2 homeruns. During the last week of games, Perez has scored 8.7 Fanduel fantasy points while his season average is 8.5. He has a batting average of 0.188 and a slugging percentage of 0.438 over that time. Cameron Maybin - OF DET Fanduel: 3300 Draftkings: 4400 - Maybin squares off verse Brett Oberholtzer at Comerica Park (Detroit, Michigan). Oberholtzer has an ERA against righties of 5.05 with a wOBA of 0.391. In addition he really has been pretty weak on the road. His ERA on the road is 6.16 and his wOBA is 0.393. Over the last 7 days Maybin has scored 19.8 Fanduel fantasy points while his season average is 11.2. He has a batting average of 0.467 and a slugging percentage of 0.733 over that time. Maybin at home crushes it. He has an ISO of 0.084 and has a wOBA of 0.401. Maybin hits lefties in a big way, with an ISO of 0.077 and has a wOBA of 0.37. His matchup it too much to overlook. Trea Turner - OF WAS Fanduel: 3900 Draftkings: 4700 - Turner is going against Jorge De La Rosa at Nationals Park (Washington, D.C.) which ranks number 6 in runs scored. De La Rosa has an ERA against righties of 4.98 with a wOBA of 0.350. Additionally, he isn't doing well on the road. His ERA on the road is 5.4 and his wOBA is 0.360. Throughout the last 7 days Turner has scored 15.4 Fanduel fantasy points while his season average is 14.4. He has a batting average of 0.419 and a slugging percentage of 0.548 over that time. Turner at home0.221 and has a wOBA of 0.384. Bryce Harper - OF WAS Fanduel: 3700 Draftkings: 4800 - Harper will face Jorge De La Rosa at Nationals Park (Washington, D.C.) which ranks number 6 in runs scored. De La Rosa has an ERA against lefties of 5.34 with a wOBA of 0.343. Also he has not done well on the road. His ERA on the road is 5.4 and his wOBA is 0.360. Throughout both of their careers, Harper has faced Jorge De La Rosa 9 times with a slugging percentage of 0.444. During the past week Harper has scored 17.4 Fanduel fantasy points while his season average is 12.1. He has a batting average of 0.414 and a slugging percentage of 0.655 over that time. Harper at home is awesome and his ISO is 0.213 and has a wOBA of 0.345. J.D. Martinez - OF DET Fanduel: 4100 Draftkings: 5200 - Martinez will be pitted against Brett Oberholtzer at Comerica Park (Detroit, Michigan). Oberholtzer has an ERA against righties of 5.05 with a wOBA of 0.391. Also he has not done well on the road. His ERA on the road is 6.16 and his wOBA is 0.393. Martinez has scored 14.7 Fanduel fantasy points while his season average is 12. He has a batting average of 0.370 and a slugging percentage of 0.593 over that time. Martinez at home crushes it. He has an ISO of 0.312 and has a wOBA of 0.459. Martinez hits lefties in a big way, with an ISO of 0.281 and has a wOBA of 0.41. Adam Duvall - OF CIN Fanduel: 3100 Draftkings: 4900 - Duvallwill go against Zack Godley at Chase Field (Phoenix, Arizona) which ranks number 2 in runs scored and number 7 in home runs allowed. This could be a shoot out with an over under of 9.5, so expect a lot of runs to happen! Godley has an ERA against righties of 5.17 with a wOBA of 0.318. Also he has not done well at home. His ERA at home is 5.86 and his wOBA is 0.370. During the last week of games, Duvall has scored 15.2 Fanduel fantasy points while his season average is 11.2. He has a batting average of 0.273 and a slugging percentage of 0.591 over that time. Duvall on the road is great! His ISO is 0.269 and has a wOBA of 0.339. Duvall hits righties very hard. His ISO is 0.287 and has a wOBA of 0.343. He should score some big points for you today if he is starting. Jayson Werth - OF WAS Fanduel: 3400 Draftkings: 4400 - Werth is facing Jorge De La Rosa at Nationals Park (Washington, D.C.) which ranks number 6 in runs scored. De La Rosa has an ERA against righties of 4.98 with a wOBA of 0.350. Also he has not done well on the road. His ERA on the road is 5.4 and his wOBA is 0.360. During their history against eachother, Werth has faced Jorge De La Rosa 19 times with a slugging percentage of 0.737 with 2 homeruns. Werth at home is money. His ISO is 0.176 and has a wOBA of 0.338. Werth hits lefties big time, to the tune of an ISO of 0.288 and has a wOBA of 0.454. He has a great matchup today. Justin Upton - OF DET Fanduel: 3400 Draftkings: 4100 - Upton is facing Brett Oberholtzer at Comerica Park (Detroit, Michigan). Oberholtzer has an ERA against righties of 5.05 with a wOBA of 0.391. In addition, he is really struggling on the road. His ERA on the road is 6.16 and his wOBA is 0.393. During the last week of games, Upton has scored 24.1 Fanduel fantasy points while his season average is 9.2. He has a batting average of 0.417 and a slugging percentage of 1.042 over that time. He also has hit 4 homeruns. Upton at home0.184 and has a wOBA of 0.32. Look for a big game.